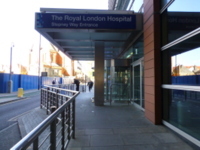 The hospital is located in Whitechapel, east London. The main building is off the A11 Whitechapel Road. 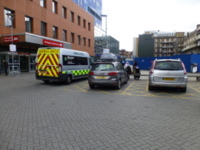 There are a small number of parking spaces for Blue Badge holders only outside the Emergency Department. These are reached using Cavell Street then Raven Row, off Whitechapel Road. 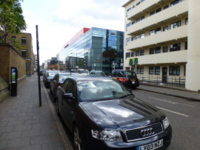 There are also a small number of Blue Badge bays outside the Royal London Dental School, reached using Turner Street off Whitechapel Road. There is provision for dropping off but no parking at the rear entrance in Stepney Way. Whitechapel Road is a no-stopping zone. There is very limited pay and display parking in some of the surrounding streets at the rear of the hospital. TFL buses 25, 205, 254 and night buses N205 and N253 travel along Whitechapel Road in both directions. Westbound (towards central London) the nearest bus stop is Whitechapel Station Royal London Hospital Stop A. Eastbound (heading out of central London) the nearest stop is Whitechapel Station Royal London Hospital Stop B. All London bus services have an automatic powered ramp at the central door and designated space for a wheelchair user. An Oyster card, contactless bank card, prepaid travel card or travel pass is required to travel on London buses. The nearest station is Whitechapel Station, served by London Overground services. Due to Crossrail Construction works the station entrance has been temporarily relocated from Whitechapel Road to Court Street. Directions back to Whitechapel Road are clearly signposted. There is no step-free access to the Overground line at this station. There are 50+ steps from platforms to the street. The nearest station with step-free access from train to street is the Docklands Light Railway service at Shadwell. This is about 10 minutes walk south of the hospital. Whitechapel Station is also served by the Hammersmith & City and the District Underground Lines. Access is via the same temporary entrance on Court Street. There is no step-free access to the Underground lines at this station. There are 30+ steps from the platforms to the street. When the new Crossrail construction work is complete in December 2018 there will be step-free interchange between all services at Whitechapel Station and step-free access to the street from the redeveloped entrance on Whitechapel Road. 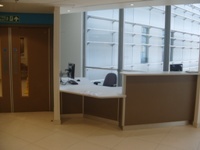 The Patient Advice and Liaison Service (PALS) is located on the second Floor Central Tower, Main Building, near lift core 5. The telephone number for the Patient Advice and Liaison Service (PALS) is 020 3594 2040. The email address for the Patient Advice and Liaison Service (PALS) is pals@bartshealth.nhs.uk. 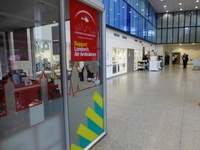 Volunteers can be found in entrance foyers or by contacting the reception desks at the Whitechapel Road - Main Entrance and Stepney Way entrances. To obtain mobility aids please contact staff at the reception desks at the Whitechapel Road - Main Entrance and Stepney Way entrances. There are usually wheelchairs available at the entrances to the hospital. A £1 coin is required to release the wheelchair from the docking station. Forget Me Not – Information for Carers link (new tab) - click here. All these services are located near the PALS Office. Please see the guide to Patient Support Services for details. 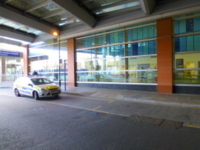 The car park is located outside the Emergency Department, reached from Cavell Street and Raven Row. There is/are 6 designated Blue Badge parking bay(s) within the hospital car park. 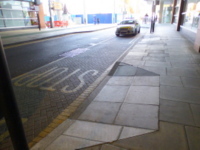 The dimensions of the designated Blue Badge parking bay(s) surveyed are 360cm x 600cm (11ft 10in x 19ft 8in). The drop-off point is located at the rear of the building, off Stepney Way. Free parking for Blue Badge holders is for 5 hours only. 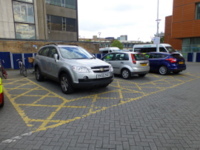 The nearest designated Blue Badge parking bay is approximately 20m (21yd 2ft) from the Emergency Department entrance. Waiting or drop off/ pick up is not permitted in the car park. Waiting is limited to 10 minutes at the drop-off point in Stepney Way. You are on Public Parking. Skip to the next section. There is not a car park for public use within approximately 200m (219yd). There is limited on-street pay and display parking in Turner Street, at the rear of the hospital. In most of the surrounding streets parking is not permitted or is for resident permit holders only. You are on Getting To (Ward 11F). Skip to the next section. 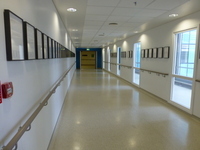 Ward 11F is/are located on the eleventh floor of the south tower. 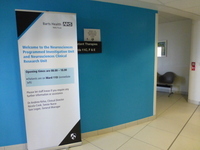 Access to Ward 11F is via the Stepney Way Entrance (nearest) or Main Entrance - Whitechapel Road. 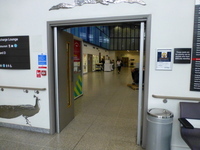 From the Stepney Way Entrance, go through the doorway to the right of the entrance foyer. 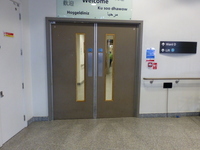 Continue ahead past the Air Ambulance Kiosk towards the double doors on the far side. 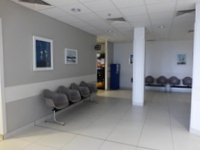 There are toilets, seats and a refreshment kiosk in this area. Go through the double doors and continue ahead ignoring lift core 4 to the left and the stairs to the right. Go through the next double doors then take the doors to the right into lift core 5. Take the lift to the eleventh floor. From the lift lobby, turn right in the shared waiting area. Go through the double doors and then left into the bridge link corridor. Continue on this corridor passing through double doors held open. Ward 11E is on the right. 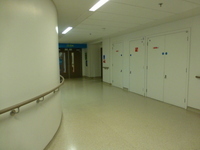 Follow the corridor round to the left and Ward 11F is ahead. 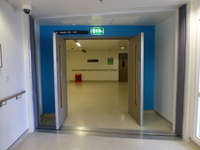 There is step free access, via lift, to Ward 11F. Ward 11F is approximately 65m from the lift core 5. 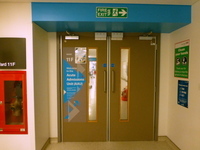 There is a/are manual, heavy, double door(s) between the Stepney Way Entrance and the department/service. 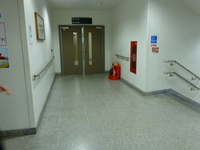 From the Main Entrance - Whitechapel Road, follow the main corridor to the right of the Pharmacy all the way to the rear of the building and the Stepney Way entrance foyer. Go through the doorway on the left then follow the directions as for the Stepney Way Entrance. You are on Outside Access (Stepney Way Entrance). Skip to the next section. 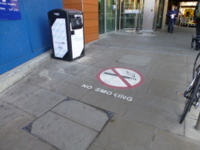 This information is for the entrance located at the rear of the North Tower, off Stepney Way. 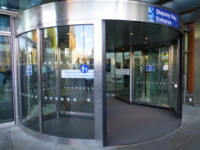 The accessible door is to the left of the revolving door. There is no hand sanitiser at this entrance. The width of the door opening is 128cm. The ramp/slope is located to both sides of the entrance. 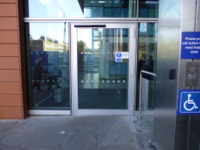 The accessible door is opened by reception after contact using the intercom. There is a push button to exit, 120cm high. The handrails to the ramp are on the road side of the path, to the right approaching from the left of the entrance or to the left when approaching from the right. 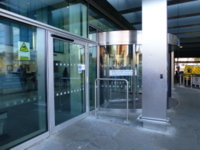 The automatic revolving door has a push button to the right which is intended to slow it to a speed suitable for wheelchair users or others with mobility difficulties. The push button is within 90cm-105cm of the floor. This entrance is open 06:00 - 22:00 but there are security staff based at the reception here overnight for emergency access to the main building. You are on Lift (Lift Core 5 - Main Public Lift). Skip to the next section. The lift is located at the rear left of the building from the Main Entrance - Whitechapel Road, or to the right from both Stepney Way entrances. The lift is approximately 100m (109yd 1ft) from the Main Entrance - Whitechapel Road. 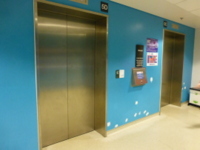 The floors which are accessible by this lift are G,1,2,3,4,5,10,11,12,13,14. The dimensions of the lift are 209cm x 161cm (6ft 10in x 5ft 3in). There are no controls other than the alarm call within the lift. There are 4 lifts; A, B, C and D in this lift lobby. There are touch screens to select the floor required. 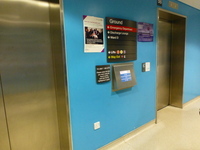 The screen indicates which of the 4 lifts to take. 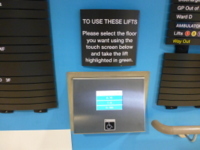 The control panel on the right of the lift lobby as you enter has an additional button for wheelchair users. This triggers the audible announcer in the lift lobby. There are tactile and Braille markings on this button. For access to floors 6-7-8 for the Children's Hospital and Women's Centre, please see the guide to lift core 9. For access to Floor 9 Urology please see the guide to lift core 1. You are on Eleventh Floor Visitor Facilities. Skip to the next section. 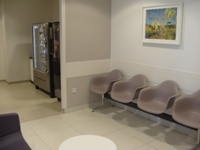 As you exit lift core 5 on the eleventh floor there is a reception/waiting area. The reception desk is not usually staffed. There are fixed chairs with armrests and room for a wheelchair to manoeuvre. 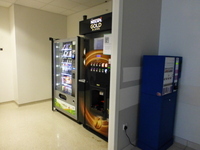 The waiting area has vending machines for drinks and snacks and for purchasing credit for the bedside entertainment system. 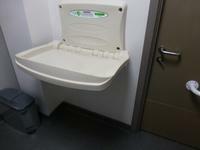 This area has accessible and standard toilets and a baby changing/feeding room. There are also 2 bedrooms for relatives to stay in, which are equipped with a bed, wardrobe and a chair. 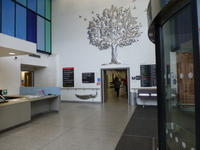 You are on Outside Access (Ward Entrance). Skip to the next section. This information is for the entrance located on the eleventh floor. There is an intercom at this entrance. 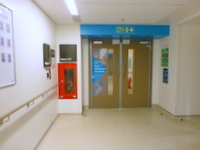 All wards are accessed by using the intercom system located at the entrance. The intercom is placed at a height of 118cm from the ground. Staff on one of the staff bases will release the entrance doors to allow access. You are on Reception (Staff Bases A and B). Skip to the next section. 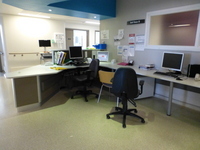 The desk/counter is 25m (27yd 1ft) from the ward entrance. There are 2 staff bases (A and B) within the ward and the details are similar for both. 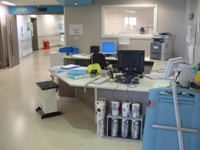 There is level access in the ward. The area/room/bay surveyed was 5. There is a/are door(s) to the area/room/bay. The door(s) is/are single width with a small extension leaf. 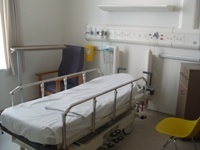 There is room for a wheelchair user to manoeuvre around the bed(s)/between beds. The bed(s) has/have bedside storage. Bedside services available include; televisions, telephones, radios and the internet. 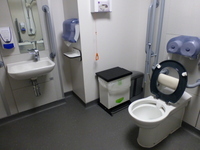 There is an accessible toilet for visitors to use on the ward. There is not a standard toilet for visitors to use on the ward. 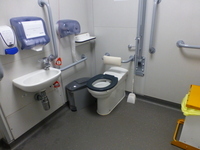 There is a standard toilet for visitors to use outside the ward. The distance to the standard toilet for visitors to use is 25m (27yd 1ft). There is a bathroom on the ward. A flashing alarm is not available. A vibrating alarm is not available. 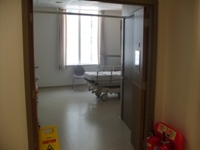 The ward has 4 bays which have 4 beds. 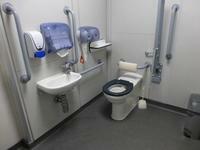 Each bay shares the use of a bathroom which has an accessible shower and toilet. The ward has 10 side rooms. Each side room has its own ensuite bathroom with an accessible shower and toilet. Children under 14 are not allowed to enter the ward. The Patient Bedside Entertainment system allows patients to buy credit to surf the internet, watch television and to listen to the radio and audio books whilst in the hospital. 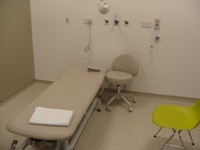 The system must be used with headphones, which are available to purchase or patients may bring their own. 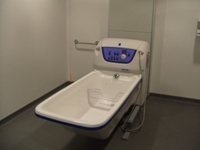 You are on Accessible Bathroom (Assisted Shower Room). Skip to the next section. Accessible bathroom facilities are available. There is/are 2 accessible bathroom(s) in this ward. There is/are 1 accessible bathroom with a wheel in shower and 1 with a bath. The bathroom is not for the sole use of disabled people. 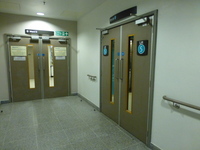 There is pictorial signage on or near the accessible bathroom door. 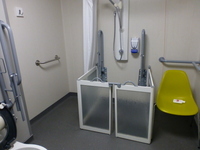 The accessible bathroom is 35m (38yd 10in) from the ward entrance. There is level access to the accessible bathroom. A key is not required for the accessible bathroom. The dimensions of the bathroom are 320cm x 200cm (10ft 6in x 6ft 7in). The bathroom has a non slip floor. The bathroom does have an unobstructed minimum turning space of 150cm x 150cm in front of the toilet seat. The wash basin height is 80cm (2ft 7in). There is a mixer tap for the wash basin. There are mirrors in the accessible bathroom. There is a standard chair located in the bathroom. You are on Accessible Bathroom (Assisted Bathroom). Skip to the next section. 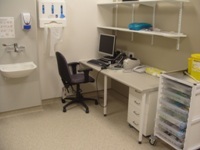 The accessible bathroom is 30m (32yd 2ft) from the ward entrance. The dimensions of the bathroom are 350cm x 500cm (11ft 6in x 16ft 5in). There are not wall mounted handrails available. 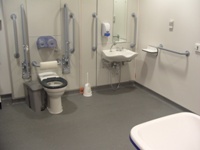 This accessible toilet is located on the right as you enter the ward. 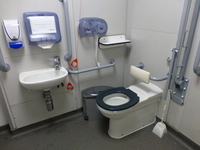 The dimensions of the accessible toilet are 180cm x 260cm (5ft 11in x 8ft 6in). The contrast between the wall-mounted grab rails to the right of the toilet and wall is fair. The nearest standard toilets and baby care facilities are located in the eleventh floor visitor waiting area as you leave leave lift core 5. You are on Telephone Numbers. Skip to the next section. There is an alternative telephone number for Ward 11F which is 020 3594 2809. 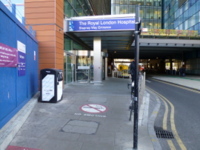 The Royal London Hospital link (new tab) - click here.